Michael Redmond 9P has been providing the English game commentary for the Lee Sedol-AlphaGo match, with American Go E-Journal Managing Editor Chris Garlock. On Friday, the break day before the match resumes on Saturday with Game 3, Redmond sat down with Garlock to recap the first two games and look ahead to the critical third game on Saturday. Game 1: Underestimating AlphaGo: Lee Sedol, taking black, played a really unusual opening in the first game. I think he had a plan to try to throw the computer off course by playing an opening it didn’t have in its’ database. But I’ve been talking to the Deep Mind programmers and it’s not actually a database but machine learning that recognizes patterns, so AlphaGo doesn’t need to have an exact match and it doesn’t really matter if some of the moves are slightly different, so AlphaGo can judge the situation, which is quite different from the usual computer programs and closer to the human way of thinking. So Lee’s plan to play something that AlphaGo hadn’t seen before just didn’t work. And in fact, Black 27 was an overplay and Lee got in trouble himself and I think it’s because he was playing an opening that he really wasn’t familiar with and probably underestimating AlphaGo. Even though he mostly recovered from that mistake, White 102 clearly took Lee Sedol by surprise. It’s a move I was expecting, because White had to do something like that, although of course you need the reading to back it up. 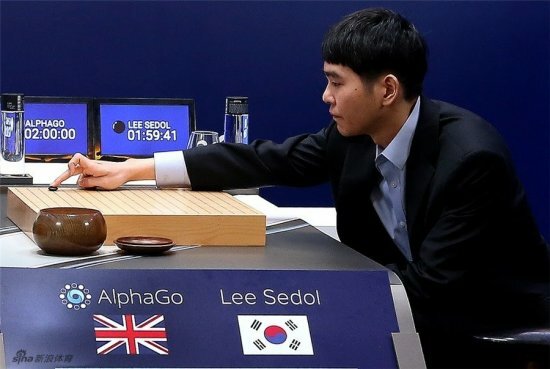 It’s a move Lee Sedol should have been looking at and I think maybe one of the reasons he might not have been looking at it is that maybe he underestimated AlphaGo and wasn’t treating it like a top human player. In this game, I didn’t find anything I would call original in AlphaGo’s play, it was just plainly strong. Click here for Redmond and Garlock’s Match 1 15 min Summary. Game 2: AlphaGo’s Exquisite Game: In the second game, AlphaGo had black, and I was looking to see how it would play. In the games with Fan Hui, I wasn’t impressed with AlphaGo’s opening; it was really too orthodox, and too simple for a game with black, because of the big komi. Black needs to play more aggressively or more of a speed-oriented game. So I was interested to see how AlphaGo had changed since last October. So it was rewarding to see that AlphaGo was playing moves that were not conventional and they were speed-oriented and putting pressure on Lee Sedol from the start of the game. And then there was the shoulder-hit at move 37, which was a move that really took me by surprise and I’m pretty sure it took Lee Sedol by surprise too. One of the programmers dug into the files and found that the possibility of playing that move was something like one in ten thousand so it was a really unlikely move but it happened to be on the edge of AlphaGo’s search and in the analysis of the possible variations, AlphaGo decided to knock it up to the move that it would choose. I still don’t really understand the mechanics of it but it’s really interesting. Not only does AlphaGo have good shape or pattern-matching, but it can also think itself out of that and find something completely different, even though it might not have had a good score in the pattern analysis. That game on the whole was an exquisite game by AlphaGo. I actually thought that Lee Sedol had a pretty good chance to win up until the middle game and the game was sort of in the balance for a while there, but then almost before you notice it, AlphaGo had very subtly built up an advantage after Lee Sedol played a few slack moves. 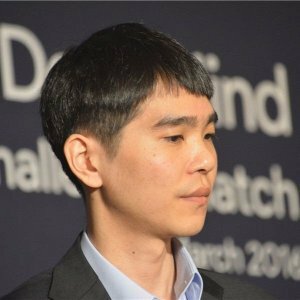 In this game, Lee Sedol took territory in the beginning, allowing AlphaGo to sort of dance around the board and take the initiative, and that’s not really typical of Lee Sedol, so once again he wasn’t really playing his own style. Click here for Redmond and Garlock’s Match 2 90-second Summary. If I were Lee Sedol I’d just play an opening I’m familiar with and I wouldn’t worry about whether AlphaGo knows the moves or not and then he should continue into the middle game along a familiar path in which case he’ll be more at home and less likely to make mistakes. When Lee Sedol plays well he’s brilliant, of course. If he plays his own game I think he’s more likely to get into the middle game with a favorable position, which is really necessary. He hasn’t done that in these first two games; he’s been going into the middle game in a fairly difficult position. If Lee Sedol has a favorable position in the middle game, that’ll be something new for AlphaGo, something we haven’t seen yet. Just as a test of the program itself, that’s something I really want to see how it handles that. The third game in the 5-game Lee Sedol-AlphaGo match will be Saturday, March 12, (Friday night 8p PST, 11p EST). The match will be livestreamed on DeepMind’s YouTube channel with commentary by Redmond and Garlock. And catch Cho Hyeyeon 9P’s commentary with Andrew Jackson starting at 9P PST on the AGA’s YouTube Channel. Over 60 people watched the broadcast of the first game between Lee Sedol and the Google Deepmind AlphaGo program at the Seattle Go Center. They enjoyed pizza, fresh bread baked by Chris Kirschner, and some Korean take-out food. About 25 people stayed until Lee Sedol resigned at 11:30 pm local time. The second game attracted a smaller group — they only had two pizzas, compared to the six ordered the night before. 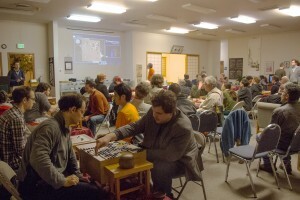 The watch parties attracted a few new players, most of whom were invited by go playing friends. More noticeable were the old friends from the Eastside of Lake Washington, where the Microsoft campus is. Rush hour traffic often makes it hard for Eastside residents to come to the Go Center for the evening, but since these games started later, at 8 pm, it was easier for them to drive. The Seattle will have watch parties for all of the remaining games, with Dennis Wheeler as host. “There will be three more, as Lee Sedol has committed to play the entire five-game match,” noted Go Center Manager Brian Allen. The schedule will be posted on the Go Center Google Calendar. Photos: Left: Finishing a game on a goban as the first AlphaGo game starts, Right: Exploring variations during the 2nd game. Photos/report by Brian Allen. AlphaGo is badass. Like the honey badger, AlphaGo just don’t care. Lee Sedol may have underestimated AlphaGo in game 1, but he knew what he was up against in game 2. I watched Michael Redmond’s commentary during the game, then Myungwan Kim’s commentary this morning. The Go Game Guru commentary is also very helpful. The tenuki at move 13: Professionals always extend at the bottom first? AlphaGo don’t care. It builds a nice position at the top instead. The peep at move 15: This is usually played much later in the game, and never without first extending on the bottom. AlphaGo don’t care. It adds 29 later, and makes the whole thing work with the creative shoulder hit of 37. It even ends up with 10 points of territory there. With 64 and 70, Lee Sedol made his group invulnerable to prepare for a fight at the top. AlphaGo don’t care, it just builds up its framework, and then shows a lot of flexibility in where it ends up with territory. Lee Sedol threatens the territory at the top with 166? AlphaGo don’t care, it just secures points in the center instead. Points are points, it doesn’t matter where on the board they are. 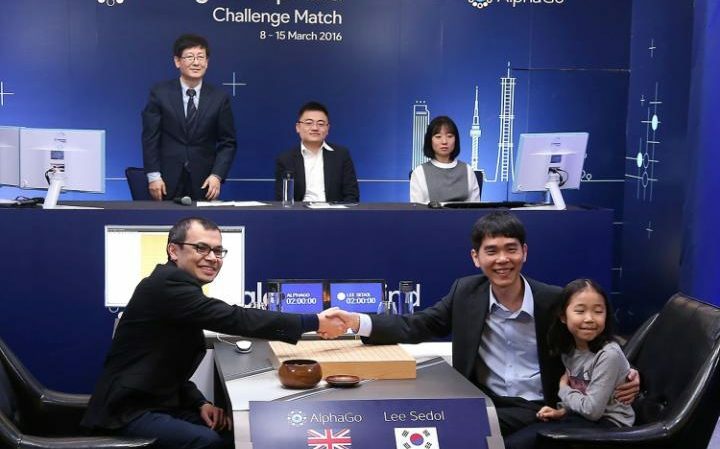 What can Lee Sedol do in the next games? I think he needs to get a complicated fight going early in the game, start ko fights, in general increase the complexity. But I fear AlphaGo just won’t care. Kierulf is the founder of Smart Go, “a Utah corporation dedicated to creating a strong go-playing program with a superior user interface.” In addition to creating the various SmartGo software programs, Kierulf has published dozens of go e-books. This post originally appeared on the SmartGo blog. 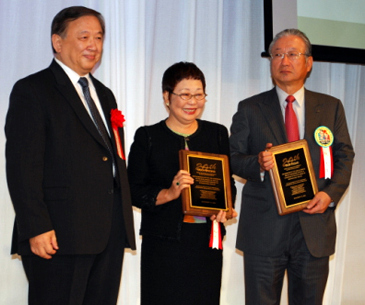 49th Kido Prizes: Though the magazine Kido is defunct, the Kido Prizes for the outstanding Nihon Ki-in players of the previous year are still awarded. The 49th Prizes were announced in the February 22 issue of Go Weekly. They went as follows: Most Outstanding Player: Iyama Yuta, Sextuple Crown; Outstanding Player: Ida Atsushi Judan; New Face: Kyo Kagen, King of the New Stars; Women’s Prize: Xie Yimin; International Prize: Ichiriki Ryo 7P; Most Wins: Iyama Yuta & Kyo Kagen (41 wins); Best Winning Percentage: Shibano Toramaru 2P (81.25%, 39 wins, 9 losses); Most Successive Wins: Iyama Yuta (24); Most Games Played: Yamashita Keigo (60). Xie makes good start in Women’s Meijin defence: The first game of the 28th Women’s Meijin title match was held in the Arisu-kan, a building in the grounds of Heian Women’s University in Kyoto on February 28. Taking black, Xie beat Aoki Kikuyo 8P by resignation. The third round of the 41st Meijin League was completed on February 25 when Kono Rin 9P (W) defeated league newcomer Uchida Shuhei 7P by resignation. Kono had a bye in the first round and lost in the second, so this is his first win. 4th CCTV New Year’s Cup: This tournament is organized by the CCTV station in Beijing to celebrate the Chinese New Year. This year it was held from February 9 to 11, with one player each from China, Korea, and Japan taking part. 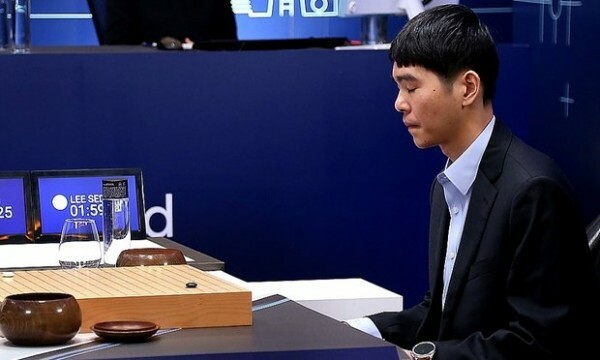 China was represented by Ko Jie, who tops the Chinese ranking system by a comfortable margin, Korea by Lee Se-dol, who is the top player so far of the 21st century, and Japan by Ichiriki Ryo 7P, who was invited in recognition of his win in the 1st Globis Cup and his three successive wins in the second round of the current Nong Shim Cup. The format is the same as the NHK Cup (30 seconds per move plus ten minutes’ thinking time to be used in one-minute units). After drawing lots, Lee was seeded into the second round. In the opening game Ko Jie (B) beat Ichiriki by resig. In the second round, Lee (B) beat Ichiriki by resig. In the final, Ko beat Lee (I don’t have details). 2016 Four Cities New Stars Tournament: This team tournament for young players (age limit 25) was held at the Korean Kiwon in Seoul from February 19 to 21. Presumably the cities were Seoul, Beijing, Tokyo, and Taipei, but the report in Go Weekly lists countries rather than cities. The teams are made up of eight players, including two female players, so it’s quite a large-scale tournament. The result was that Korea and China tied for first with two wins and one draw each, but China took precedence thanks to its higher number of individual wins (19 to Korea’s 16). With one win (ten individual wins), Japan came third, and Chinese Taipei came fourth with no wins (three individual wins). The best performance for Japan was posted by Kyo Kagen 3P, who won his three games. The complex, tense game ran nearly five hours and appeared to offer validation of AlphaGo’s evaluative ability, the main roadblock to proficiency for previous go programs. 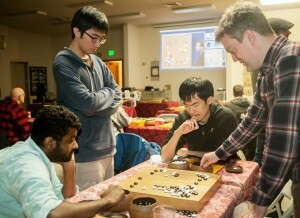 Hassabis said that AlphaGo was confident in victory from the midway point of the game, even though the professional commentators couldn’t tell which player was ahead. Lee, the winner of 18 world championships, must now win all three remaining games to win the million-dollar prize. Click here for the Game 2 commentary by Michael Redmond 9p with American Go E-Journal Managing Editor Chris Garlock. The third game in the 5-game Lee Sedol-AlphaGo match will be Saturday, March 12, (Friday night 8p PST, 11p EST). The match will be livestreamed on DeepMind’s YouTube channel with commentary by Redmond and Garlock. 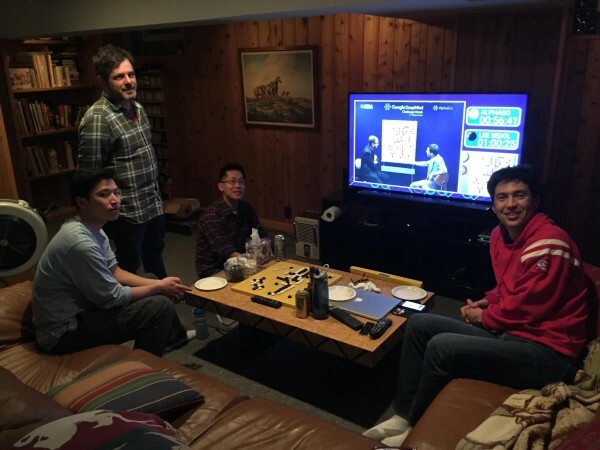 The Evanston Go Club hosted a watch party for the first Alpha Go-Lee Sedol game at the home of club president Mark Rubenstein on Tuesday night. “We all feel like we’ve been part of go history tonight,” said Rubenstein. “It’s an incredible achievement, one which most of us thought was many years away, if at all. I’m stunned, and a little sad. I always liked being able to say that computers couldn’t beat the strongest humans. It’s a new world!” Watching the game were Nathan Chan, Jeff Pratt, Moon Ki Cho, and Scott Ogawa. The second game in the Lee Sedol-AlphaGo match will be Wednesday, March 9, 8p PST (11p EST). The match will be livestreamed on DeepMind’s YouTube channel with English commentary by Michael Redmond 9p with American Go E-Journal Managing Editor Chris Garlock. Xie defends Women’s Kisei: The challenger for the 19th DoCoMo Cup Women’s Kisei title was Yoshihara Yukari 6P, who held this title for three years in a row before losing it to Xie in 2010. The opening game of the title match was held at the Hotel Sun Life Garden in Hiratsuka City, Kanagawa Prefecture on January 21. It was a very exciting contest, with the lead switching back and forth, but Xie (right) managed to pull ahead by half a point in the endgame. 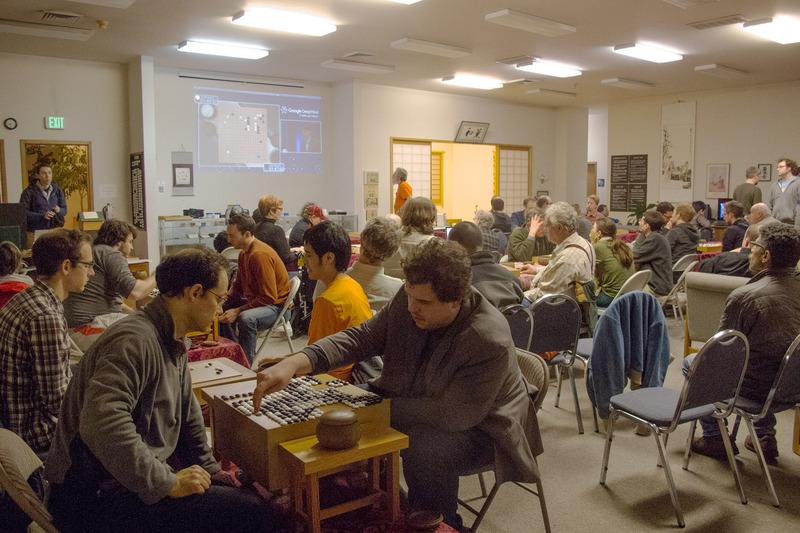 The second game was held at the Ryusei Studio in the basement of the Nihon Ki-in in Ichigaya, Tokyo on February 1. It was another close game, but Xie, playing black, won by 2.5 points. 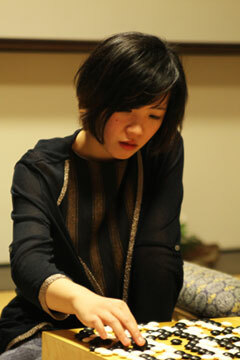 Xie thus defended the Women’s Kisei title with straight wins and maintained her triple crown. She has now held this title for four years in a row and six times overall and has extended her tally of titles to 22. Ishii Kunio wins 1,000th game: Ishii Kunio 9P, best known these days as the teacher of Iyama Yuta, has won his thousandth game. He reached the landmark with a win over Yamashiro Hiroshi 9P in the preliminary round of the Masters Cup. His record is 1,000 wins, 603 losses, 1 jigo. He is the 18th player at the Nihon Ki-in to win a thousand games and, at 74 years three months, is the oldest; he is in his 59th year as a pro. He is also the first such member of the Kansai branch of the Nihon Ki-in. He commented that while he regrets not having won a title, in a way he is proud of the fact that he is the first such player to reach this mark. When asked which was his most memorable game, Ishii answered in detail. ‘I guess my win over Lee Chang-ho [in the 2001 Fujitsu Cup]. Besides that, I have strong memories of my win on white with no komi in the rating tournament over Ishida Yoshio 7P when he held the Honinbo title. Ishida was probably not psyched up for the game. The game when I beat Fujisawa Shuko to win a place in the Honinbo League; the game when I beat Rin Kaiho in the main section of the Judan tournament when he was Meijin. Sakata Eio Sensei stood and watched the whole game. When it was over, he said: “I’m astonished, really astonished. What was your name?” This is still a vivid memory. They are not counted among the thousand, but I also have vivid memories of the best-of-three match with Nie Weiping in the Japan-China go Exchange when I played as a substitute for Kobayashi Koichi and won 2-1.’ Ishii also mentioned that his only form of study is looking at Iyama’s games. The annual promotions based on prize-money earnings for the previous year were announced in the February 8 issue of Go Weekly. They are listed below. 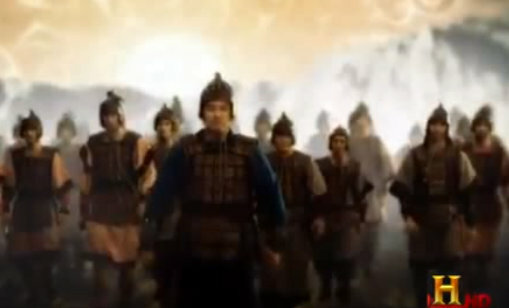 Peter Shotwell just caught one of the History Channel’s two-hour “Art of War” series devoted to the teachings of Sun Tzu’s book by the same name. A professor from the Military College of Canada and several very knowledgeable authors began with a vivid in-depth discussion of Sun’s classical war and life ideas. This is followed by the Vietnam interplay between chess-thinking American bombing, battle strategies left over from WWII vs. the evolving Sun- and go-like Vietnamese strategies and use of spies that culminated in the Tet Offensive and its complicated aftermath. Finishing it was a highly innovative discussion of the clash of the two kinds of thinking during the Battle of Gettysburg and the World War II invasion of Normandy. It’s now on You Tube, and all the material plus a discussion of the role of language and the use of the “36 Strategies” is available in Appendix VIII of Shotwell’s “Speculations” article in the Bob High e-Library. 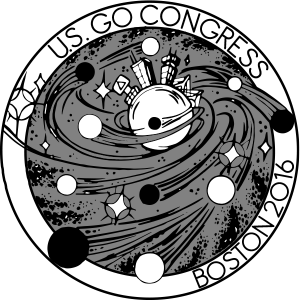 At the insistence of staff counsel at Boston University, the US Go Congress and AGA this year will be instituting tougher procedures for the appointment of guardians for under-18s staying at BU for the Go Congress without parents, AGA President Andy Okun told the EJ. “It is more involved than in previous years, which is regrettable, but campuses and their lawyers are feeling some pressure in the wake of the Penn State scandal. More vigilance in this area seems to be both inevitable and a good thing, and this is just the year we have to start.” If under-18s are staying in campus housing without a parent or formal legal guardian with them, a parent will have to sign a waiver and appoint an onsite guardian, as has been necessary since 2011. That guardian will have to be staying in the same housing and be attending Congress in the same time period, as always. The new requirement is that the guardian will also have to undergo a database background check by a third party service hired by AGA, as well as a brief online training in the protection of minors. AGA will charge the parents $25 for the background check, although the actual cost will vary and likely be more. The BU policy doesn’t apply to kids who are not staying in campus housing; for them, Congress will ask parents to sign a form as in prior years, but without the need for background check or training. Congress this year has booked some rooms at a hotel near the campus and other housing options are available around Boston. Questions about the policy can be addressed to president@usgo.org or director@gocongress.org. The forms will be ready within the next week or so, Okun said.